Quality of Music used in Worship is one of the most distinguishing features of Good Shepherd. For many years, the parish has devoted significant time, energy and resources to build an exceptional music program. The music presented at each service — both instrumental and choral — is consistently respectful and inspirational. The parish choir, made up of professional and amateur singers, performs a classic repertoire of sacred music from the Renaissance to the present day with special emphasis on the English choral tradition. Among our parishioners are several respected members of Greater Boston's professional music community, and those individuals, from time to time, share their musical gifts to enrich our worship services and social events. 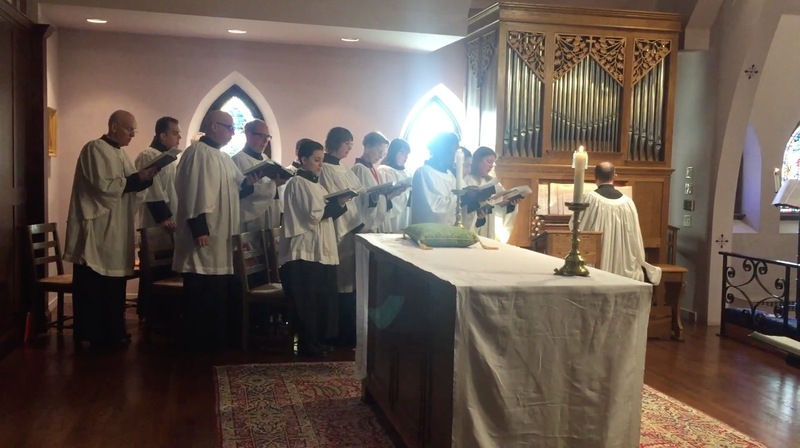 The Good Shepherd Parish Choir is a small, well balanced, and carefully trained ensemble dedicated to supporting our worship through hymns, anthems, plainsong and Anglican chant, and other service music. 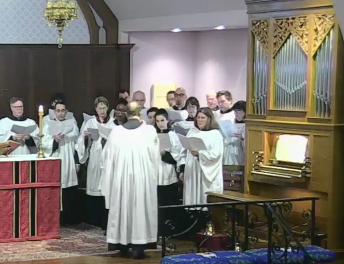 The choir sings a variety of works, largely drawn from the Anglican and Latin choral traditions. Many of the anthems are sung without instrumental accompaniment. The choir includes both professional and dedicated volunteer singers who share a strong commitment to providing high quality music that is an essential part of our worship. Currently, the choir consists of 7 professional and 10 volunteer members. We welcome new members who have basic music reading skills and the desire to work cooperatively within this disciplined choral group. Those interested in singing with the choir, either as a volunteer or as a professional, should contact Dr. Klein at the church office. "Mine Eyes for Beauty Pine"
"O Lord, Give thy Holy Spirit"
"O Lord, in Thee is All My Trust"
"What Wonderous Love is This"
Regular Service and Rehearsal Times are as follows: The choir sings at the 10:00 a.m. Sunday Sung Eucharist each week (except during late June, July and August), as well as at evening services on Ash Wednesday, Maundy Thursday, Good Friday, Easter Eve, and Christmas Eve. Other services such as Choral Evensong and Benediction are scheduled as occasions arise. Rehearsals begin at 8:45 a.m. each Sunday, with rare special rehearsals. Dr. Carl Klein is the Director of Music and principal Organist. Carl holds degrees in organ performance from Mansfield University of Pennsylvania (BM1986) and from The Eastman School of Music (MM1988; DMA1991), and he has been the Organist and Choirmaster at Good Shepherd since 1999. Carl often composes and arranges music used in our worship. Carl also works for Fisk Organ Company in Gloucester, Mass, and serves as the Librarian for the American Guild of Organists. He is a respected member of the New England community of organists and a uniquely gifted and dedicated choral director. The Collins Organ is a two manual tracker action pipe organ, installed in the chancel of Good Shepherd in 1996. This organ, dedicated on Pentecost 1995, was built by the well known English organ builder, Peter Collins (of Melton Mowbray, Leicestershire, England), who has built organs for a number of prominent English and Scottish churches. The organ has a non-identical twin located in the music studio of Mr. Kenneth Ryder, Organist of the Parish Church of Saint Peter Mancroft, Norwich, England, in the Close of Norwich Cathedral. 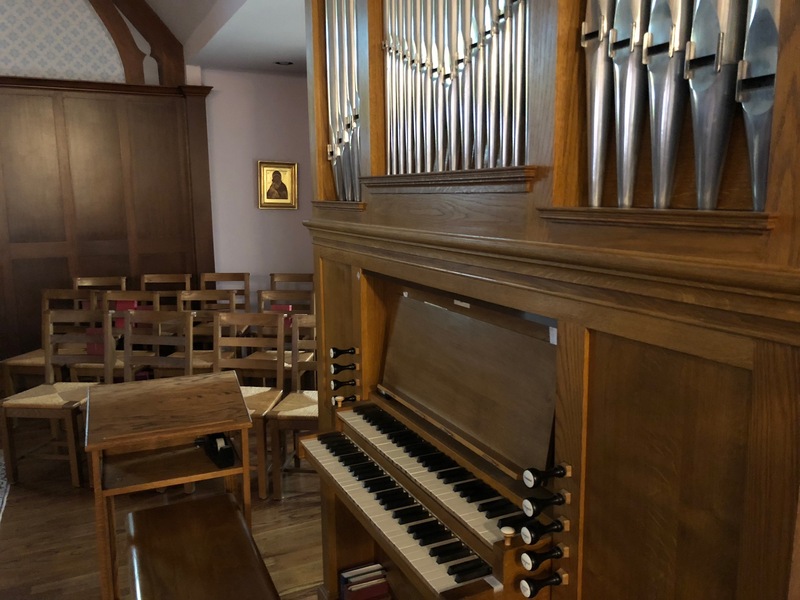 The Collins organ is used to accompany hymns and is especially effective in organ music from the German Baroque masters Bach and Buxtehude to the 20th century French organ works of Dupre and Messiaen. Suspended action to upper Manual, backfall action to lower Manual. 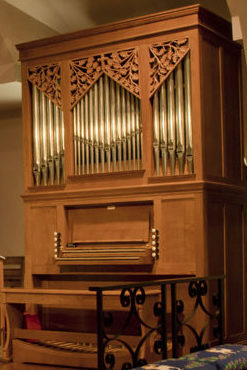 The organ was revoiced in 2003/2004 to maximize volume and fundamental tone. The Lower Man/Pedal coupler was added at this time. Work was done by Stephen Paul Kowalyshyn. The Zimbelstern, added in 2009, was given by John and Wilma Kassakian in honor of their granddaughter. The pipeshades, carved by Allen Klein in 2008, illustrate a text from St. John's gospel (15:5), "I am the vine, you are the branches." An inter-manual coupler (upper to lower), engaged by pushing the upper manual in, was added in 2011 by Jonas Berg.